Now our struggle was not nearly as difficult as the struggles of others. I would not for a moment even begin to suggest that we have tasted the kind of hatred or been subjected to the kind of violence that was faced by the freedom fighters who achieved so much under the leadership of Dr. Martin Luther King. I do however know very clearly that we drew our inspiration from their struggles. The life and witness of the Reverend Dr. Martin Luther King, Jr. inspired and continues to inspire millions of people to seek justice, to stand up for freedom and to love in the face of hate. Dr. King is more than just an inspiration to justice seekers and peacemakers, he is an example of what it means to impact the evolution of our species. 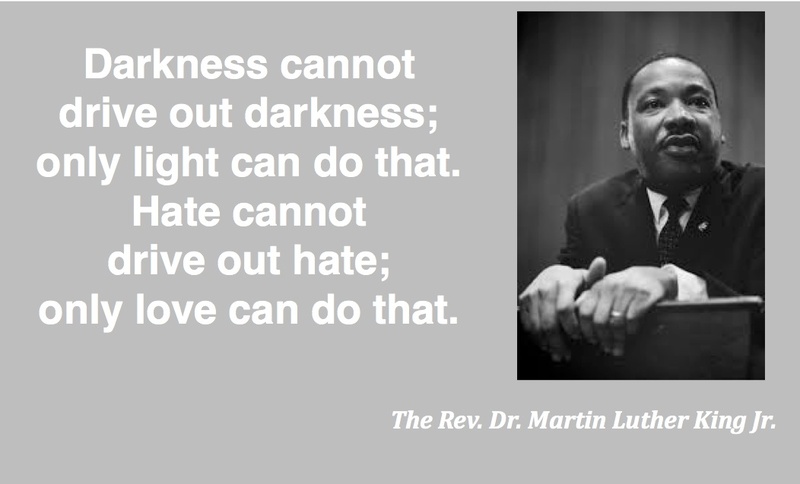 Humans are better beings as a result of the many ways in which Dr. King changed the way we interact with one another. Creation is not the same as a result of the life and witness of Dr. King. In the stories handed down to us by the writer know as John we are told that right from the very beginning of his public ministry, Jesus began to have an evolutionary impact on the people who bore witness to his life. Jesus’ contemporaries didn’t quite understand what it was that Jesus was about. The writer of the Gospel according to John has John the Baptist describe Jesus as “God’s sacrificial lamb, who takes away the sin of the world.” We know now that this was an attempt by a later generation to put the whole of Jesus life and death into some sort of context that first century people would understand. Sadly, all these generations later, and this first century attempt to explain who Jesus is, has been literalized beyond what any first century person could ever comprehend.That God would resort to violence to change humanity, is an abominably idea, when you consider the reality of Jesus’ commitment to non-violence. For it is Jesus refusal to pick up the sword in the face of the kind of violence that we can only begin to imagine. Israel’s Roman oppressors were exacting in their use of terror to keep the people of Israel in line. Jesus knew full well that he might die for his convictions and still he spoke out, loudly, clearly, publicly, under the shadows of the hundreds who had dared to speak out before him and found themselves hanging upon trees until they died and the desert suns roasted their corpses. Jesus knew the risks, and in the face of hatred Jesus chose love. Under threat of violence Jesus chose peace. And when they executed him and he hung there dying, Jesus chose not to condemn his murderers, but to forgive them. The life and witness of Jesus of Nazareth inspired and continues to inspire millions of people to seek justice, to stand up for freedom and to love in the face of hate. Jesus is more than just an inspiration to justice seekers and peacemakers, he is an example of what it means to impact the evolution of our species. Humans are better beings as a result of the many ways in which Jesus changed the way we interact with one another. Creation is not the same as a result of the life and witness of Jesus. God did not demand a blood sacrifice. John the Baptist got it wrong, but who could blame him, he was working out of an old religious paradigm that Jesus blew out of the water (and that pun was definitely intended). The religious authorities had never seen the like of Jesus before. They simply didn’t have the words to describe what Jesus was about. Humans simply didn’t act the way Jesus was acting. Jesus’ impact on our species was so dramatic that we still don’t have the words to describe what he was trying to teach us. But every once in a rare while someone comes along like Martin Luther King who catches a glimpse of the kind of upside down world that Jesus was talking about. Dr. King’s dream of a world were judgment is not based upon the colour of a person’s skin but on the content of their character, came from somewhere deep inside of Dr. King and inspired him to live in such a way as to make that dream visible to millions of people. I believe that this kind of inspiration is exactly how the Source and Ground of our Being lives and breathes in the world.I believe that once in a rare while we catch a glimpse of what Jesus called the Reign of God and when we catch such a vision it is as if it takes hold of us and we are compelled to see beyond our own fear so that we can find the courage within ourselves to be more than we are. And so as we begin to live into our dreams of a better world, others begin to see the possibilities and light begins to shine in the darkness as we dare to drive out hate with love. Some people call this kind of inspiration Divine. The Christian Mystics tell us that this is what they mean when they say that, “God became human so that humans can become Divine.” I believe that each and every one of us has this kind of vision. Sometimes we let our fears cloud this vision. Sometimes we are enabled by the strength of those around us to stare head on into the possibilities of what love can achieve and we find the courage to live into our visions of a future where justice abounds for everyone. Jesus found the courage to share his vision with the world. Jesus said, “I have come that you might have life and live it abundantly.” Jesus shared his vision of life without fear where people are free to live fully, to love everyone, and become all that our Creator created us to be. Jesus shared his vision by living it. Jesus refused to be confined by the rules and regulations of his day and choose freedom. Jesus refused to hate and renounced violence and choose love and generosity over fear. Jesus lived this freedom in ways that infected those around him with a vision of what is possible. Jesus lived into his full humanity even though he knew that it might cost him his life and the world was changed as a result of the way in which Jesus lived his life. New life became a possibility for humans as people began to explore this new way of being in the world. Jesus showed us what it looks like when a human allows himself or herself to live into our divinity. As a result of Jesus life and witness others have been inspired to allow themselves to live into their full humanity and thereby express their own divinity. Martin Luther King, Jr. was inspired by Jesus’ life and witness to find the courage that lay inside of himself, the courage he needed to love in the face of hatred. This is the season of Epiphany; epiphany is an ancient Greek word that means manifestation or embodiment. Epiphany is often used to describe a remarkable, striking realization. The life and witness of Jesus of Nazareth is an epiphany for in Jesus we are struck by the remarkable realization of what is possible. In the Reverend Dr. Martin Luther King, Jr. we also see an epiphany a miraculous breakthrough of humanity and divinity. There is a story that is told about the darkness that descended upon Dr. King. It’s a story that I have often turned to when the darkness has threatened to overwhelm me. I’d like to read that story for you now because in that story I hope you will see the kind of epiphany it has always been for me. “After a long day of struggle, Dr. King returned to his parsonage, exhausted after another long day of organizational meetings. Coretta and their two-month-old daughter, Yolanda, were already asleep, and King was eager to join them. He would not be so lucky. Stirred into wakefulness, King made a pot of coffee and sat down at the kitchen table. “I felt myself faltering,” he said. It was as though the violent undercurrents of the protest rushed in upon him with heightened force, and he surveyed the turbulent waters for a way of escape, searching for an exit point between courage and convenience-“a way to move out of the picture without appearing a coward”-and he found none. “I was ready to give up,” he said. King thought of baby Yoki sleeping in her crib, of her “little gentle smile,” and of Coretta, who had sacrificed her music career, according to the milieu of the Baptist pastor’s wife, to follow her husband south. For the first time, he grasped the seriousness of his situation and with it the inescapable fact that his family could be taken away from him any minute, or more likely he from them. He felt himself reeling within, as the Psalmist had said, his soul “melted because of trouble, at wit’s end.” “I felt myself . . . growing in fear,” said King. Sitting at his kitchen table sipping the coffee, King’s thoughts were interrupted by a sudden notion that at once intensified his desperation and clarified his options. And as the voice washed over the stains of the wretched caller, King reached a spiritual shore beyond fear and apprehension. “I experienced the presence of the Divine as I had never experienced Him before,” he said. “Almost at once my fears began to go,” King said of the midnight flash of illumination and resolve. What are we ready to face? What wrongs are we called to right? What injustices are we called to end? Creation is crying out for us to act to save the planet. Our First Nations sisters and brothers are crying out for justice. People of colour continue to be abused. Recent immigrants need fair and equitable treatment. The poor need homes, food, and jobs. The struggle for equality among women and men continues GLBT folk continue to seek equality. How will humanity be changed by your life and witness? Friends: let me assure you that the presence of the Divine is yours. Our humanity has been changed forever. Thanks to the life and witness of Jesus of Nazareth, of Martin Luther King, of Gandhi, Gautama Buddha, Muhammad (peace be upon him) thanks to Jullian of Norwhich, Megtheld of Magdeburg, of Martin Luther of Germany, of Carol of Phillipsburg, Tom and Maryann of Uxbridge, Jon and Dianne of Guelph, Joyce of Belfast, John of Birmingham, Patricia of Burlington, Gunter of Fenland Falls, Rick of Newmarket, all the good people of Holy Cross, Bishops Susan and Michael and my colleagues and friends in ministry, because of so many people who have chosen love in the face of fear, my humanity has been changed by you and I have seen visions of what is possible when fear is replaced by love. Each of us has the gift of a life to live. Let our lives bear witness to the divinity that lives and breathes in, with and through us. Let our lives bear witness to love. Let freedom ring through you! Choose love in the face of fear. Kindness and generosity in the face of hatred. Peace in the face of violence. Freedom in the face of oppression. Be love in the world. Each of you have the gift of a life to live. that lives and breathes in, with and through you. Let your life bear witness to love. She just laughed and said, “Darlin you’re a women aren’t you? Sing it child. Sing it proud! So I invite you to stand and sing children, sing it proud! This entry was posted in Evolutionary Christianity, Progressive Theology, SERMONS, STORIES, Theology and tagged emergent theology, evolutionary christian sermon, evolutionary christianity, John 1:29-42 Jan.19, Jr., Martin Luther King Jr, progressive Christian sermon Epiphany 2A, progressive Christian sermon John 1:29-42, progressive Christian sermon Martin Luther King Jr, progressive christianity, spirituality, the Rev. Dr. Martin Luther King, theology by Rev. Dawn Hutchings. Bookmark the permalink.